"Willow" Model Approx. 1,429 Sq.Ft. South Facing Suite With 9Ft Ceilings. Premier Layout With 2 Walk-Out Patios. New Low-Rise Condominium With Immediate Occupancy. Includes, 1 Parking Spot. 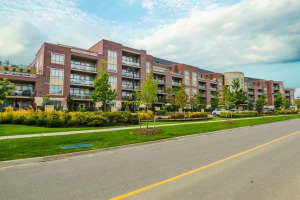 Steps Away From Main Street, Shopping And Go Station. Amenities Include Indoor Pool, Fitness Room, Party And Games/Media Room. Hot Water Tank Rental $17.42/Month. Hvac Rental $90.39/Month.